Last chance to enter Holiday Extravaganza! Such an amazing response for the Holiday Extravaganza this year! 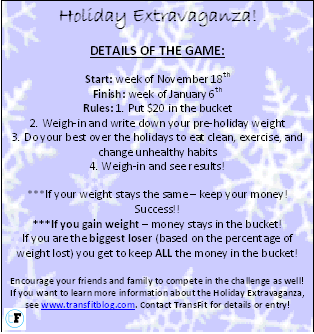 I am extending the Holiday Extravaganza weigh-in’s until Tuesday this week! Message me if you still want to enter! Over $1,200 in the cash pot and fun prizes for 2nd & 3rd place! The game is the best way to keep you accountable over the holidays! Again, special Thank you to the local business who are supporting the Holiday Extravaganza!